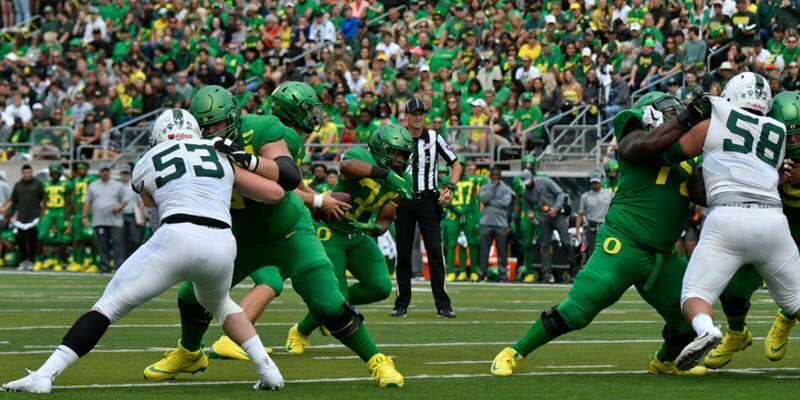 The Zone Read: Is the PISTOL a Good Fit for Oregon? Alright … I was wrong in last week’s article. And not just once, but in a couple of places. I was erroneously applying prior knowledge of the Oregon Spread Offense to the new Oregon Offense that features the Pistol formation the majority of the time. In this article, I will apologize, own up to my errors (each of them) and look into the benefits of the Pistol. Together we can ponder whether this new formation fits Oregon. The Spread formation stretching a defense. The No-Huddle or fast tempo, popularized by you-know-who. 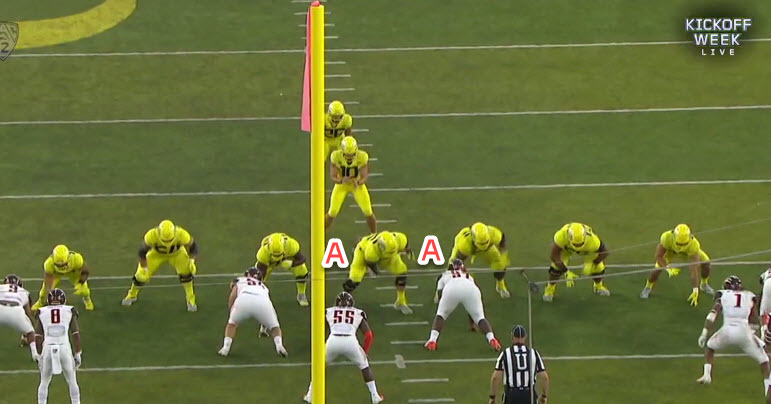 The previous Oregon offense had these components, but it would appear that the new Pistol formation features these elements, as well, for Coach Mario Cristobal. We do need to clarify a misconception about the Pistol: It is not a system, a defined offense, as most of us would think. It is simply a formation to run within a Spread Offense, and every coach can integrate his own versions of the Inside Zone, Outside Zone, Counters, Power plays … the entire running playbook, along with his own passing attack. 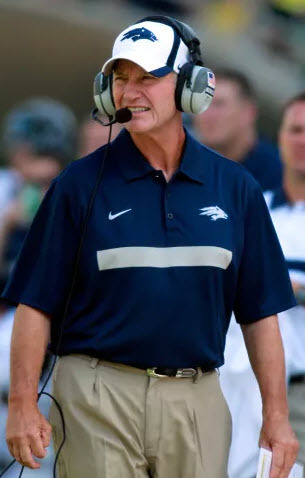 The number of variations of the Pistol being used nationally are quite surprising, and what we will refer to on this site originated with Chris Ault at Nevada and the Running Backs Coach for the Wolfpack at that time, Jim Mastro. (He now holds the same position at Oregon). For example, one misconception is that you must have a running quarterback to make the Pistol successful. That is incorrect. There are coaches around the nation that use the Pistol for its powerful downhill running advantages, and do not even use the Zone Read aspect of the Pistol. There are some coaches who have added the Pistol formation to improve their passing game because of the built-in benefits of the formation! What Do Coaches Like about the Pistol? Coach Chris Ault wanted to run the Shotgun Spread at Nevada, but wanted more of a power running game than the Spread offered with its off-set running back in the backfield. His tinkering created the Pistol as we know it now. Coach Jim Mastro is quoted often on coaching websites, and to have access to his playbooks and training videos from both Nevada and Washington State is quite a coup for the Cristobal staff. The list of benefits of the Pistol is long, but the power-running style, where you can effectively carry out an old Pro-Style “I” offense within a spread formation, is the top advantage mentioned by coaches. That certainly seems to fit with the Cristobal staff considering who they are recruiting at quarterback and offensive line. The formation can create leverage and bring additional blockers to the opposite side of the line-of-scrimmage to block alley defenders with running backs, receivers and especially tight ends/H-backs as “slice” blockers. Play action passes operate a touch better in the Pistol due to the limited visibility of the running back directly behind the quarterback, which creates an extra second of indecision for the linebackers and secondary. The “slice” or “slip” receivers and tight ends referred to above, who move across the LOS to block, can also catch passes in underneath routes, as we saw with Tabari Hines’ touchdown catch on Saturday. In fact, the intermediate routes to Brenden Schooler (another admitted error by me) and the long routes that led to touchdowns by Jaylon Redd and Johnny Johnson revealed the full gamut of a passing attack that can operate within the Pistol. Another advantage of the Pistol given by coaches is the ability to run the same plays out of multiple Pistol formations and sets. A base offense in the Pistol can present over a dozen looks to the defense, with all the variations created in the past decade. Coaches like how they can achieve the hat-on-hat blocking and even gain an extra blocker on occasion to use on double-teams. Offensive coordinators can flip the side the play is going to, the playside, with audibles and without moving personnel. What ABOUT the loss of Back-Side Zone Reads? I am an idiot. 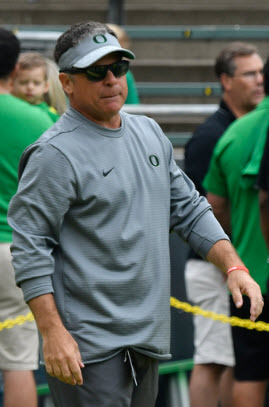 I did not want to commit a ton of time and money to researching offenses this summer until I was certain what Oregon was running in actual games. I did not have the time in one day (Sunday) last week to research it before my Monday article, and thus, wrote in a flippant, uniformed way. The truth is, all read keys, or the defenders being read by the quarterback, in the Pistol are all on the same side as the quarterback, just as they were before in the CK offense. The running back may run on one side of the center or other (A gaps), but the defender being “read” and the quarterback are on the same side as before. The “A” gaps the running back in the Pistol is aiming for. Above are the “A” gaps that the running back is targeting, and we will get into the tiny details in future analysis articles. For now — know that the RB takes a stride toward the side the play is planned, or the playside, and goes forward quickly. Braxton Burmeister sees his “read-key” defender sitting. We need to alter much of our terminology with the new offense. For example, we no longer have “Zone Reads,” but “read-keys,” as those are the defenders being “read” by the quarterback. 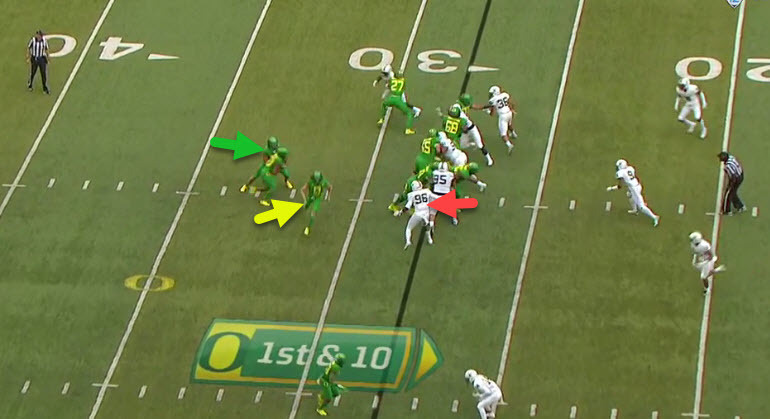 Above, we see Braxton Burmeister (green arrow above) checking his “read-key,” the defender with the red arrow. Since the defender is sitting or defending that gap, the proper decision is to hand the ball off to the running back, as he does. It does not happen this way often (above), but it will more in the second half of the game, when the defense is tired of trying to defeat blocks and pursue the quarterback in the pocket. Justin Herbert is checking the “read-key” defender. 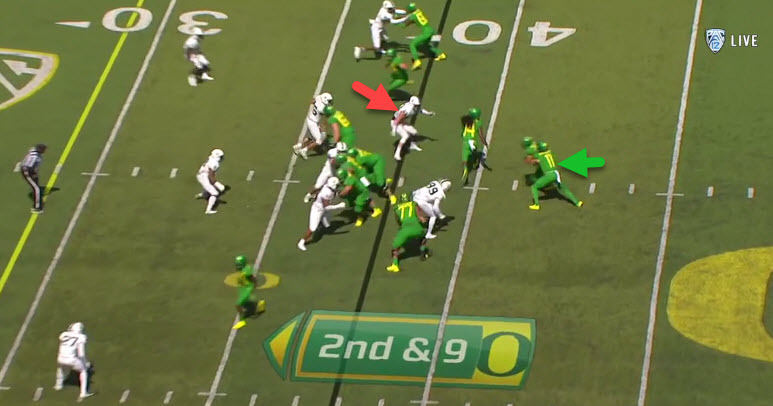 Above, we see Justin Herbert (green arrow) checking his “read-key” defender (red arrow), and he sees that the defender is closing into the LOS and the running back. Thus, the correct decision is for Herbert to pull the ball and head outside. Note that Brenden Schooler (yellow arrow) is the slice blocker, although in this play, he appears to be looking for a pass. Hence, this play is a RPO, a run-pass option play. It is important to note as you watch this video above … that my comment last week about the quarterback having to run between the tackles was an epic boneheaded assumption. If the quarterback gets a “pull” read, then he is supposed to run outside and follow his slice blocker, who is looking to nail the “force” defender, or the player of the opposing defense responsible for guarding that perimeter. The “Slice” blocker is avoiding the “read-key” defender. 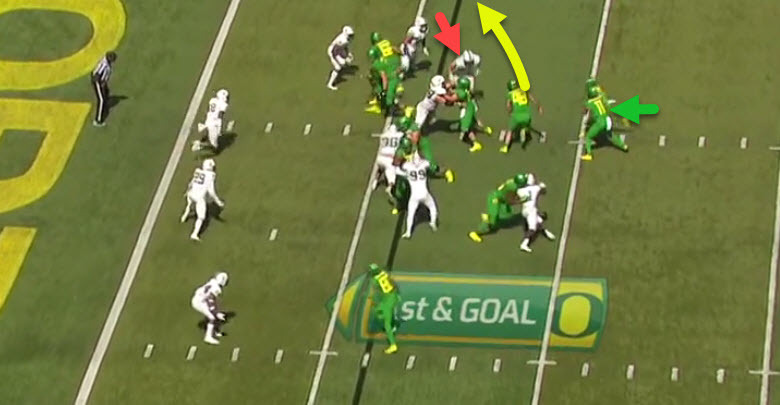 Above, we see Burmeister (green arrow) noting that his read-key (red arrow) is crashing inside to stop the running back, hence pulling the ball is the correct decision. Note also that the slice blocker (yellow arrow) is purposely avoiding the read-key and is looking to block on the outside. Overall, it would seem that the Pistol is a great fit for Oregon in what they wish to achieve — a power running game coupled with a sophisticated passing attack. The number of plays where they had read-keys was quite low compared to the total number of plays, and you know my only concern with this offense is illustrated in the example above. This article marks the beginning of a new section in the Oregon Analysis Library, the area called The New Oregon Offense with the Pistol. Although it will contain many components that are not Pistol-related, we wish to have an area that is different than what Willie Taggart had in his short time at Oregon. You will continue to see this analysis library grow as Coach Eric Boles and I add to it, although I will still be offering my opinions on Oregon football via editorial articles, even if they are occasionally flawed. When I do make a mistake? I will own it, apologize and correct it. Remember that I am not a coach or former player; I am just a fan like you who simply wants to learn. And we have an exciting time to do it!